Play Romance of the Three Kingdoms 2 Now! In any case, the graphics and sound are updated or this newer version. Some of the stats on the various leaders have changed, and some of the commands and tactics have been changed around. 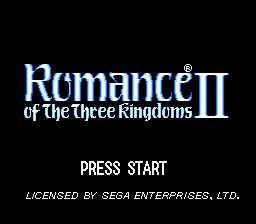 Romance of the Three Kingdoms 2 is commonly regarded as the worst of the series, but that's still pretty good considering how awesome this series is.